The dirigible aircraft in Ringon airport took off. It carried six passengers: the pilot, Leorio, Kurapika, Melody, Chrollo and Pakunoda. At the first sight of the woman wearing a blazer and a short skirt, Melody was sure that there would be no blood bath inside the zeppelin. She was certain that no Genei Ryodan members followed Pakunoda on her way to the airport. It was also clear to her that the woman came alone to save her boss and had no intention to fight. The remaining concern was Kurapika. Did the Kurta notice the difference between Paku and the other members of the troupe? 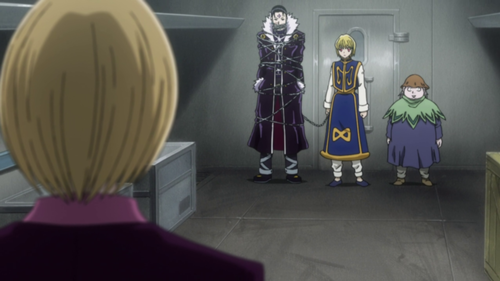 Kurapika stood a meter apart from the chained leader of the Phantom Troupe. He sent his judgment chain floating in the air, ready to pierce Chrollo’s heart. While the Kurta was discussing his terms, the constricted young man couldn't help but feel worried about what was going on with the spiders. He wanted to speak, but the chains which covered his mouth prevented him to do so. “The first one will be, no usage of Nen is allowed.” Kurapika was sure about this rule. The next condition made her stop and think for a moment. He remembered the last time he saw his platinum blonde-haired friend Pairo. “I don’t want to lose a friend anymore… I must save them!” An image of Gon and Killua appeared inside his mind. He missed them suddenly. The excitement to see them again urged the scarlet-eyed boy to state the last condition. “Communications of any forms with a member of Genei Ryodan are not allowed.” Kurapika concluded. “Do you agree with all of these conditions? Please tell me if you do and I will pierce your leader with the blade of my judgment chain.” He directed the question to Pakunoda. “Okay.” The woman said without hesitation which astounded Chrollo. Before he could think of anything, the head of the Spider felt a sudden pain inside his chest as if he has been stabbed by a sharp object. Kurapika’s chain that was made out of Nen was invisibly wrapped around Chrollo’s heart with its blade pointed straight to the pumping organ. It was ready to perforate the heart and rob him off of his life once he broke any of the conditions set by the surviving Kurta. He succumbed again to another highlight of his past. Beside its unsightly environment and dust-filled air, Meteor City gave birth to the Phantom Troupe. It started with seven members being led by Chrollo Lucilfer. Other members include Nobunaga, Machi, Feitan, Franklin, Pakunoda and the late Uvogin. They were young and they had just discovered their abilities back then. The Phantom Troupe might be known as a group of thieves but they were an important asset for Meteor City. They acted as support for the underworld and did philanthropic deeds for the sake of the city and its inhabitants. “Being the strongest Nen user and the most important part of the organization, the limbs are blindy following its head.” This was the belief that Chrollo tried to bust. He wanted it to be clear that his orders were more important than his life. “If I died, one of you will just have to replace me. Spiders must live on.” This was only one of the few noble lines that came out of his beautiful lips. “While we are waiting for orders from the Mafia head, we will focus on adding more members to our group.” He added. The plan was short-lived. Once the orders from their clients came in, they need to keep themselves busy. Assassination was just a part of their job. They have gotten themselves used to it but this new job was totally different from their previous assignments. “These people are Nen users like us. Do you think we stand a chance against them?” Pakunoda asked. “Nope, I’m fine with it.” The teenage girl tried her best to look strong and untroubled. Deep inside, she was worried. Not just for her sake, but for her friends as well. “Just remember what I’ve said earlier,” replied the Phantom troupe leader. “It says here that we need to finish this task as soon as possible.” Nobunaga called their attention. “No problem. We just have to pick one target at a time. Let’s see if one of us can handle him alone.” Chrollo had decided on it. “Jero Pysgodu, what a name!” Nobunaga picked the first target for the team. “Okay.” Chrollo ended the conference. They prepared for the travel as fast as they could. Victorique was a huge city from the South. It didn't have much bodies of water as the city was situated at the center of a big island. The troupe arrived at night ready to strike the target. They all looked good on their black jumpsuits. Chrollo wore a black student’s uniform to emphasize that he was the leader of the group. Without wasting any time, they went ahead to their target’s mansion. The mafia sent two freelancers who were Nen users as well to accompany them. As they move closer to the place, they became more cautious of each step that they made. Upon reaching the gate of the mansion, the troupe entered on their Zetsu state and checked for people manning the property. Machi, Franklin and Nobunaga were left on the borderline to serve as a lookout while the remaining guys went inside. They would block possible reinforcements to prevent the group from getting trapped. Feitan went ahead and climbed the walls of the gate. He beheaded three guards posted nearby and checked to see if everything was clear. He threw out a hand gesture signaling the others to come inside. The nearest entrance of the house was still a few runs from the main gate. After a number of steps, they were ambushed by a battalion of uniformed guards. They all wore tuxedos and covered their eyes with dark shades. As the moon continued to shine, the ground was bathed with blood. Uvogin with his immense strength took out numerous men in black while ignoring the gunshots that tickled his stone-hard skin. The untouchable Feitan on the other hand was able to decapitate several guards in a heartbeat. They presumed that they have been detected as more and more men with rifles came out from the mansion. “Leave them all to me,” Uvogin asked them to continue the mission without him. “They are too many. We can kill them but we need more time. 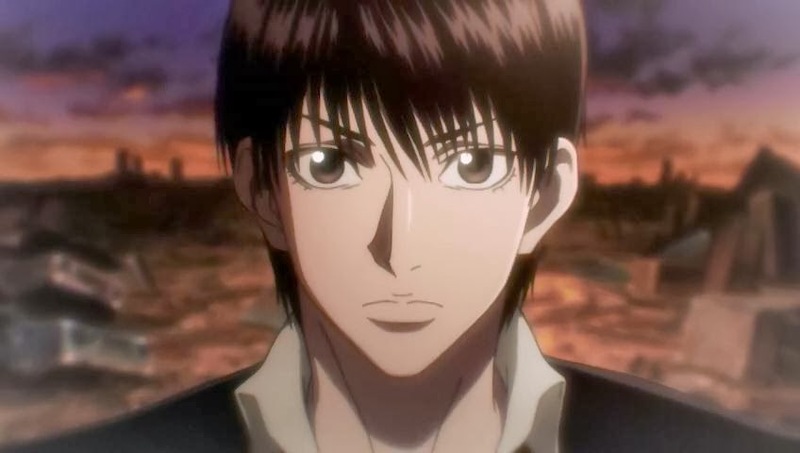 Go ahead to finish the mission and I’ll accompany Uvo.” Feitan seconded the big guy. “Let’s rendezvous inside the mansion after that.” Chrollo gave his orders. Pakunoda brought out her revolver and fired while trying to reach the main door of the mansion. Chrollo who led the way snapped the heads of those who would get in his way. The other two Nen users from the mafia group were running along with them. The pale-faced guy wearing a gray jumpsuit conjured a duplicate version of him which acted as a decoy to confuse the pursuers. The smaller guy with a striped jacket and a bandana kept on throwing marbles and pebbles on enemies who were firing at long range. “Hurry,” the conjurer whose name is Sholt called out. He commanded his duplicate to disappear and the aura that was released earlier came back to him at that instant. “Last one.” Pelt threw out an enhanced stone to a sniper that was hidden on one of the second floor windows. The four of them were able to enter the mansion from the main door. A well lit room of red and yellow welcomed the assailants. There was a gray-haired man standing at the center of the room and looked as if he was expecting the infiltration. His dark skin looked even darker with his indigo shirt and black pants. He was also carrying a bowl which appeared to hold something that moves very fast. It had no water but the two silver-colored fishes are contented to swim inside of it. “Okay.” She reloaded her revolver with bullets and aimed it to their target. “Your mafia heads are dirt bags. I should have known from the start that they’ll stab me at the back when the time comes.” Jero Pysgodu continued. The guy wearing a gray jumpsuit suddenly attacked from Jero’s back. Another guy of the same outfit appeared a few meters in front of the old man ready to throw a lethal chop. “Indoor Fish,” Jero immediately sent out the fishes inside the bowl. It became bigger as it transformed to its normal size which was the same as that of a human. The first swam to the guy at his back while the latter opened its mouth and tried to devour the Sholt at the front. To protect his ally, Pelt threw some enhanced marbles to the two fishes. Both were hit but it didn’t stop the fishes from attacking Sholt. Both bodies of the conjurer were hit by the attack. Sholt’s aura from Jero’s behind vanished into thin air as the original Sholt was bitten by that scary fish. Pakunoda was stunned because of the horrible sight. The duplicate was gone and Sholt’s torso floated in the air. The lower part of his body was completely devoured by the old man’s fish. Surprisingly, the unfortunate Nen user was still alive and appeared to not feeling any kind of pain. 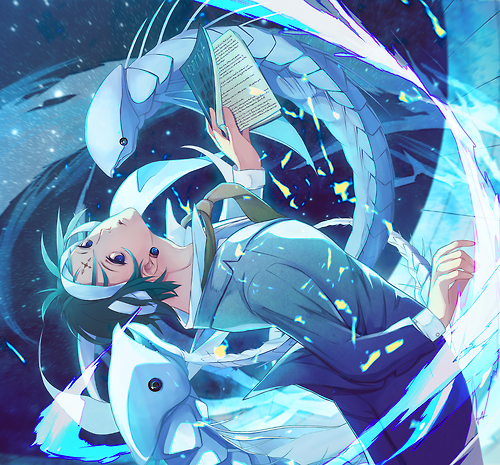 “What kind of skill was that?” Chrollo asked. “They are a pair of conjured fish that survives a closed room. He will feel it when the fishes are gone. Death comes instantly afterwards. Be thankful of me for granting you a painless death.” Jero laughed at the remains of Sholt. Pelt went berserk and hurled a lot of things at the direction of the fishes and its master. The old man was fast enough to dodge the marbles while the Indoor Fishes turned their direction to the enhancer. Pakunoda fired her first shot at Jero but the white-haired man evaded it effortlessly. “He was incredibly fast.” Chrollo thought to himself.